The final round of the tie-up in 2002 between THE HINDU newspaper and Arangham's Outreach activities ended at Bangalore in August 2002, with a one-day Creativity & Movement Workshop for select students from various schools of the city at the Sree Cauvery School, Indiranagar, Bangalore. The air of informality and spontaniety that permeates Anita's workshops found many a shy student forget his/her diffidence and emerge a more confident and creative thinker. 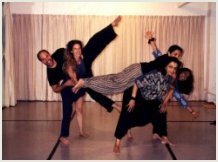 The contact improvisations and role playing that were practised raised many a laugh and enthusiasm levels went up to deafening proportions! National newspaper THE HINDU, invited Anita Ratnam to join their Newspaper in Education Programme and undertake a three-city tour with her Creativity & Movement Workshops. The tour started at New Delhi then moved to Vishakapatnam and concluded at Bangalore. A school in North Delhi was the venue for a programme of a very different kind. 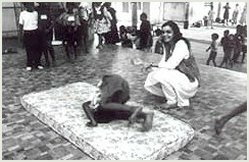 And different it was for the 60 children who converged on February 16, 2002 to experience their inner rhythm and express themselves…For the participating schools, YUVA SHAKTI, ROHINI, GURU HAR KISHAN PUBLIC SCHOOL and CRPF, Prashant Vihar, it was truly out of the routine to interact with Anita Ratnam. She led them on to a different world…the cold day evaporated into an occasion to remember. The workshop on "Interactive Creativity and Movement" by Anita Ratnam was refreshing for the pupils who shed all their inhibitions...the highlight was the choreography of Rabindranath Tagore's famous poem "Where the mind is without fear" in a few minutes by using hand and facial gestures. At the end the children crowded round Anita yearning for more. As she started her three-hour workshop at Sree Cauvery School, Indiranagar, Ms Ratnam said "Just surrender yourself and take on an adventure and let us think through our bodies" And the students, who seemed shy initially, gradually got involved and followed each instruction…breathing exercises, sessions in rhythm, exercises on trust and leadership, a game to spot dance movements…the children learned to push themselves to try out different things, respect their bodies, listen, be observant and explore the space around them. "We are happy to inform you that the participants, teachers and heads of institutions expressed their gratitude to The Hindu in conducting this workshop and the skills learnt by the participants which was professionally highlighted by your kind self and your team. "I thought it would be the usual Bharatanatyam dance class type. But, this was so different. The focus was so much on learning through fun." The exercise of blindfolded students as "cars" being directed by student "drivers" was good because the "cars" felt "there is someone to take care of you" and the drivers, felt "responsible and were in control of the situation".